Self preservation - an acute sense of prey versus predator. The equine psyche perceives the world as a threatening place with horse-eating monsters at every turn. This state of mind creates a need for a leader and close associates of its own kind. Humans, who, ages back were predators hunting horses for food are seen as a threat, not to be trusted until the equine learns better. Although the horse cannot verbalize these ideas, the fears and needs are stuck there in the back of the horse's psyche based on millions of years of past experience. Although domesticated horses need no longer fear ferocious carnivores, a paradox exists because the world in which they live is alien to most of what horses encountered in the wilds down through the ages. In addition, the close association with humans, once viewed as predators, promotes a penchant for fear and flight. Is it any wonder that some horses are confused to the point that they sometimes appear not only uncooperative, but actually combative? 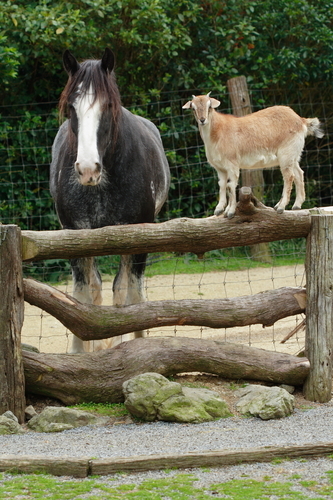 Because humans do have a slightly larger brain capacity for bridging the gap between the equine's view of the world and the world as it actually exists in our barns and stables and on the trail, it is up to us to communicate that, "Hey, everything's okay," and then develop enough trust that the horse believes it. Relating to the human-dominated world: During the initial stages of getting to know your horse, work to achieve a close bond by constantly putting yourself in your horse's place and try to comprehend each experience from the perspective of the equine's psyche. Not only will you understand and appreciate your horse more, but the horse will come to see you as a natural protector always looking out for its best interest and being patient and reassuring in the process. In addition to the bond that you create with your horse, the horse needs to recognize you as its leader. In the same way that horses test the alpha horse in the herd, they will test you by misbehaving from time to time to challenge your authority. For a horse to feel secure, it must have strong leadership with someone to make decisions and help it determine what is and isn't dangerous. Need for companionship: Providing your horse with needed companionship should not be too difficult in most cases. Keeping a horse looked up in a stall day in and day out without company is inhumane and similar to keeping a human being in solitary confinement. Most horses thrive on companionship, and when deprived of companions often become neurotic and develop destructive behaviors known as stereotypies or stall vices. The comfort of companionship allows the equine to feel safe and secure. The ideal situation is to provide one or more horses as companions to your horse, but if this isn't possible, consider other animals such as a goat, a sheep, a donkey or other hoofed animal. Many horses appear to be satisfied with attention of the two-legged variety, especially when interactions occur several times daily on a recurring basis and involve exercise. The importance of grazing behaviors: In the wild, a large portion of a horse's time is spent grazing for food, often over long distances. 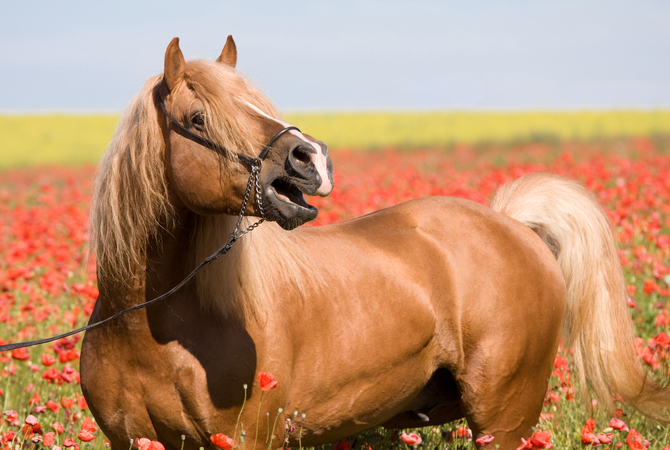 The horse's digestive system is geared to eating small amounts of food, preferably low-grade grasses or hay almost constantly. As humans need to spend time working, reading, watching TV and engaged in other activities that provide mental stimulation, a horse grazes not only for food, but also receives mental stimulation as it moves from one plant to another choosing the ones that are bet for consumption. Just as the horse's digestive system does best when constantly grazing for food, the accompanying stretching out, reaching, and walking are good for both mind and body. When watching a horse grazing in a pasture, the observer becomes aware of not only a certain serenity in the horse's activity, but also the calm and consistent use of muscles and limbs from head to toe to the tail as it swishes either to brush off a fly or just for the sheer pleasure of movement. Exercise for body and mind: For the horse that lives in confined quarters or is shut up much of the day, exercise is of special importance. Depending on the horse's personality, breed, age, lifestyle and nervous temperament, a horse needs to be free to run around or be ridden for at least 30 minutes to a couple of hours every day to prevent limb problems and release pent-up energy. Not only will the right amount of exercise improve your horse's physical condition it will also provide more stamina and a better attitude. If your horse is fortunate enough to have turn-out time in a pasture, that may be sufficient. If your horse doesn't have access to a pasture, make it a practice for either you or a helper to warm up your horse every day, first by walking and then possibly at a nice trot to increase body temperature and blood flow to the muscles followed by more vigorous riding or lunging and/or training routines. When the horse's natural need for exercise is met, you will find that not only is it more cooperative, but it also has a more calm approach to any and all events and people. By understanding your horse's psyche, you will be able to avoid many conflicts. Once you recognize that horses think like horses and not like humans, you will realize that endowing your horse with human characteristics can be very dangerous.